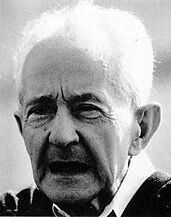 Oswald Tschirtner is among the artists associated with the Gugging group. "Gugging" is the abbreviated way of referring to the Haus der Künstler (House of Artists) established in 1981 by the psychiatrist Leo Navratil at the Lower Austrian Psychiatric Hospital in the hamlet of Gugging, outside Vienna. Many years earlier, Navratil had noticed that the art produced by certain of his patients far transcended the qualitative parameters of traditional art therapy. These artists, selected by Navratil with advice from local museum officials and artists (including the well-known painter Arnulf Rainer), began to publicly exhibit in the 1970s. Gradually, the Haus der Künstler was supplemented by other facilities on the hospital grounds, including a studio, lecture hall, sales gallery, gift shop and museum. Today, under the leadership of the psychiatrist and artist Johann Feilacher, this complex functions under the name Art/Brut Center Gugging. The Lower Austrian Psychiatric Hospital was closed in 2007 and replaced by the Institute of Science and Technology Austria, an international research center. Oswald Tschirtner was raised by an aunt and uncle in Vienna and attended seminary from a young age. He intended to become a priest, but was drafted into the German army in 1937, at the age of 16. Tschirtner fought at Stalingrad and subsequently spent time in a prison camp in southern France. After the war, he was stricken by periods of religious fervor and violent episodes, and he was sent to a psychiatric institute in 1947. In 1957, he was sent to the Psychiatric Hospital at Gugging, where he began to draw. Tschirtner’s clean, characteristically ascetic line attracted Dr. Navratil’s attention, and he became one of the first artists chosen to take up residence at Haus der Künstler. Encouraged to explore the formal quality of line, Tschirtner produced a body of elegant works that have been exhibited at the Sao Paulo Biennale, the Hayward Gallery, London, Parsons School of Design, New York, and at numerous other venues in Europe and the United States.